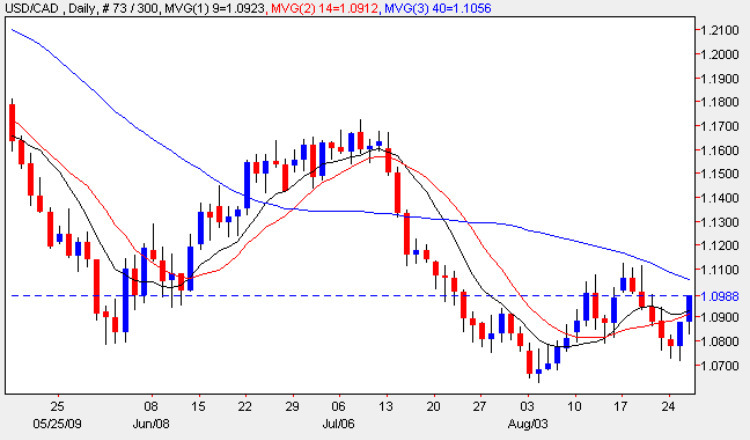 As outlined in yesterday’s forex technical analysis for the usd to cad pair, we were expecting a small bounce, and this duly arrived as a relatively wide spread up bar which closed the session with a flat top to the candle, and just below the 9 and 14 day moving averages. Whilst the short squeeze has begun, the reversal may be somewhat limited as prices will need to breach all three moving averages along with some deep pockets of resistance in the 1.10 to 1.16 price band, and whilts yesterday’s candle was a bullish engulfing signal, we need to see whether this particular move has any momentum or is simply a short term market correction before moving lower once again. Much of this will of course depend on the US dollar index, which is still looking extremely weak, and likely to collapse lower at any point. My trading suggestion once again for today is to look for small long positions as the squeeze higher continues, and over the coming days wait for any signals that the market is weakening again and looking to turn lower once again. The only item of fundamental news in Canada today is the Corporate Profits data, an odd data set which forecasts the profits earned by large corporations in the quarter, and therefore provides an insight into the broader economy. The figure released earlier was -6.4%, an improvement in last quarter’s data at -11.8%. All the other items of fundamental forex analysis are in the US, and of particular relevance this afternoon are the oil inventory numbers due shortly which whilst released in the US, have a greater impact on the Canadian dollar, and I have covered all of these in more detail on the euro vs dollar site.